4seating is proud to showcase the latest in Seatcraft's Signature series of home theater seats, The Aston. This chair features a streamlined contemporary design topped by a smooth, polished finish, that retains a sense of casual comfort. Seatcraft is aware that with modern living comes modern expectations, which is why this chair is loaded with convenient features that include wall-hugger seating, chaiselounger footrests, included tray tables, in-arm storage, lighted cup holders, and ambient base lighting. 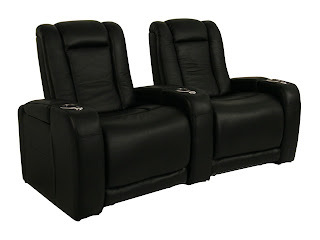 The Aston is also made from Leather 7000, a luxury material that is the finest the theater seat market has to offer. The combination of elements is what makes this an ideal chair for any guest, or perhaps for a quiet evening spent alone. The Aston's design is instantly appealing, with its smooth outer skin and gently curved armrests. This contemporary, urban sophistication is matched by an option of strong black or cognac color choices whose deep shades will blend seamlessly with any decor. The swank look of the Aston is enhanced by Leather 7000 material, which is specially crafted to look as luxurious as it feels. This special top-grain leather is of the highest quality, painstakingly hand-picked from the top 30% of all outer cowhides to represent the best that leather has to offer. The material is then buffed to remove inconsistencies in color and texture to create the sleek, sophisticated look of the Aston. This tough, durable, yet supple material will naturally conform to your body's contour while offering full support. It is easy to maintain with nothing more than a damp cloth, and actually improves in texture and appearance over time. With Leather 7000, you will be investing in a chair that will provide increased comfort and appeal for years to come. 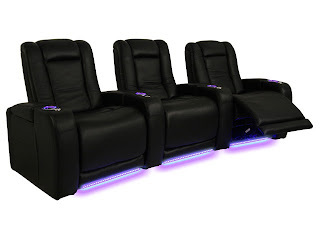 The commitment to comfort extends to this theater seat's many features. 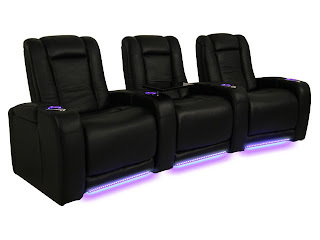 For those looking to maximize space in their home theater, the Aston was designed with a special "wall-hugger" seating that allows it sit inches from any wall, even in full recline. Padded headrests sustain support for the head and shoulders, while chaiselounger footrests ensure that the lower body is fully covered. Polished tray tables keep food, magazines, cell phones, tablets and other items within a convenient arm's reach, and can be easily removed when not in use. Hidden in-arm storage compartments provide plenty of space to store any items for the future. In addition to these features, the Aston comes equipped with lighted cupholders and ambient base lighting, which combine to accent the seat's darkly hued material with a beautiful azure glow. This lighting contributes to the authentic marquee appeal of the seat, while providing an unobtrusive means of seeing in the dark. When you invest in a home theater seat, you don't just want something that you can sit on comfortably to see the screen; you want a signature item that will provide just the right aura to complement the magic of a night out at the movies. The Aston, with its refined look and opulent material, is that seat.